Brutally cold weather will soon be refreshed as another bout of arctic air dives through the United States. The new frigid blast will make its way from the northern Plains to the eastern and southern U.S. Sunday into Monday. Although arctic air is expected to ease later in the week, any relief will be minimal and short lived. Temperatures in Minneapolis are forecast to fail to exceed zero F over the weekend. “Bitterly cold arctic air will settle in across a large swath of the U.S. as we turn the calendar from 2017 to 2018,” said AccuWeather Senior Meteorologist Dan Pydynowski. “People will really need to bundle up if they are heading out Sunday night for New Year's Eve celebrations in places like Chicago, for example, where the high will be 15 F on Sunday, around 15 degrees below normal,” he warned. Cities as far south as Nashville and Little Rock, Arkansas, will experience temperatures over 20 degrees Fahrenheit below average by the end of the weekend, where high temperatures are expected to remain below 30 F.
Frigid weather is expected to reach the Big Apple just in time to chill those visiting Times Square, though the record low of minus 4 F from 1918 will not be challenged. Temperatures will be in the lower teens as the ball drops in Midtown Manhattan on Sunday night. At that level the temperature may be within the top two lowest since records have been maintained in the 1800s. These conditions will be dangerously cold, especially for those spending many hours outdoors overnight across the majority of the eastern two-thirds of the country. In Atlanta and Chicago, it will be the coldest New Year's Eve since welcoming in 2010, when the temperature bottomed out at 29 and 5 F, respectively. “People will need to bundle up with all their winter gear in order to stay warm,” said Pydynowski. 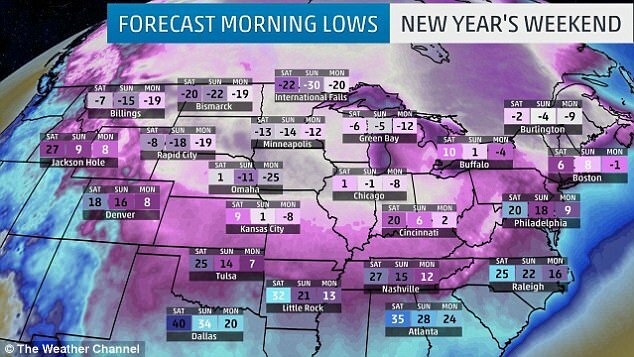 Bitter cold weather has taken hold of much of the northern US as about 220 million face below freezing temperatures as New Year's weekend kicks off. Heading into the holiday on Friday, Americans were seeing morning low temperatures in the single digits or below zero. And atop Mount Washington, the Northeast's highest peak, the temperature has hit negative 34 degrees, with a negative 89 degree wind chill as boiling water was seen turning into 'snow'. An arctic wind chill has taken hold of much of the US west of the Rockies. In Erie, Pennsylvania, a storm dumped more than 65 inches of snow in a span of four days. 'This is a crippling snow event,' Zach Sefcovic, a meteorologist with the National Weather Service in Cleveland, said on Wednesday. "They are no strangers to snow in that part of the state, but this much snow in that short a time is just unprecedented.' Sabrina Ram drove into Erie on Christmas Eve to visit her parents just as the snow began to fall. Ram, who lives in suburban Washington, DC, and her father spent five hours on Christmas and two hours on Tuesday clearing the driveway. The winter blast in Erie was caused by cold Arctic air moving over the lake, which had relatively mild water temperatures, forecasters said. A reinforcing surge of arctic air traveling south from Canada has been the cause of a great deal of frigid conditions. Weather observers atop the Northeast's highest peak say the temperature has hit negative 34 degrees, a record for the day. Adam Gill, of the Mount Washington Observatory, said the previous record of negative 31 degrees was set in 1933. 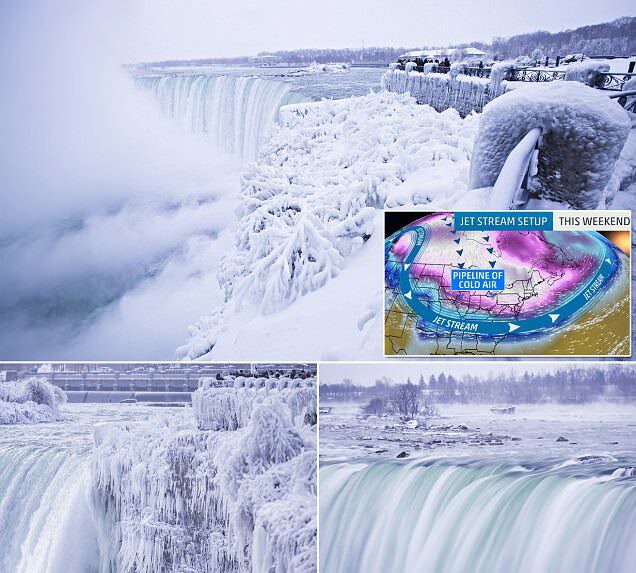 Parts of Niagara falls have frozen as bitter cold weather has swept over most of the northern United States, leaving many areas looking like Narnia. More than 220million people face below freezing temperatures on Friday, as temperatures are expected to drop further as the New Year's weekend continues. 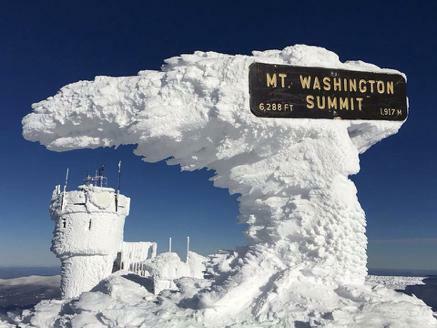 And atop Mount Washington, the Northeast's highest peak, the temperature has hit negative 34 degrees, with a negative 89 degree wind chill and videos showing boiling water being tossed into the air and turning into 'snow'. The bitter temperatures have already been blamed for a handful of deaths and cancelled in long list of weekend celebrations. Mountain weather-related headaches continue to pile up in already winter-weary parts of the Midwest and East Cost experiencing highway pileups, frozen pips and car thefts. And though the conditions may be treacherous, gorgeous photos of places such as Niagara Falls show glittering frozen icicles and bright white snow piles almost make the arctic chill worth it. Extreme Cold/Entering into the Mini Ice Age. Arctic Vortex Shift/Are You Prepared? Will your Flight be in Winter? Going into a Grand Solar Minimum creating extreme temperatures. Expect more crop failure. Some areas no summer. Can last 15 to 50 years. Why So COLD in Northern Hemisphere? Abnormal polar vortexes have hit the Northern Hemisphere for 5 years running…we think we might know why. which explains a cooling of the northern hemisphere. The world is entering a period of higher seismic activity this year that will bring more earthquakes with it, scientists have predicted. While that's undoubtedly bad news for those living within affected areas, the ability to accurately predict when and where earthquakes will occur is growing all the time. This prediction comes from the fact that the Earth is currently experiencing a periodic slowdown of its rotation. Historically, these slowdowns have coincided with peak times for earthquakes and seismic activity. "So far we have only had about six severe earthquakes [in 2017]. We could easily have 20-a-year starting in 2018,” said Dr Roger Bilham from the University of Colorado. Bilham, together with Rebecca Bendick from the University of Montana studied earthquakes occurring since 1900 that measured over 7 on the Richter Scale. They found periods of five years where the Earth's rotation slowed and these were followed by periods when seismic activity was heavier than usual. These fluctuations are usually very small, sometimes slowing a day by no more than a millisecond. But according to their research it has an effect. How and why is not yet known but it's supposed that it could have something to do with behavioural changes in the the Earth's core. Although it's impossible to predict where the earthquakes will happen, the pair's research showed that historically they occur around the equator in the Earth's tropical regions. "It appears to be a conference presentation and very preliminary rather than peer reviewed research, so there is no detail for us to examine," said GNS Science communications manager John Callan. "It is true there have been periods of elevated rates of large earthquakes in the past 100 years. However, if you go looking for correlations with other natural phenomenon, you will almost certainly find some interesting matches." Among the major earthquakes last year were a 7.1 magnitude disaster which hit Mexico City in September and 7.3 on the border between Iran and Iraq on November 12. High tide came in with the storm, flooded streets, and cars are stuck in about 2-3 feet of ice in the streets. 70 inches from the one storm alone. NEW YORK CITY 2017: Last snow in 2017! Kadovar volcano erupts for 1st time in known history. Risk of tsunamis & landslides!!! Hundreds of residents have forced to evacuate their homes after a surprise eruption from a dormant volcano, carpeting the village below with dust and ash. A volcanic plume of ash and gases rose more than two kilometres into the air over Kadovar Island off the northeastern coast of Papua New Guinea. Experts are racing to uncover the cause of the unexpected eruption as lava continues to spew from the volcano, covering more than 50 per cent of the land. Wewak District Administrator Ricky Wobar wrote on social media that the situation was 'critical' and 'worsening'. Authorities rushed to help people displaced by the occurrence as 600 people fled the island, some in dinghies, just after 12pm on Friday afternoon. 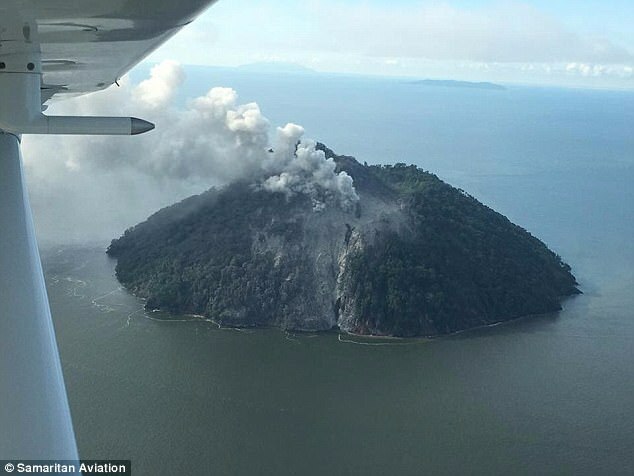 According to news.com.au, the Rabaul Volcanological Observatory has warned Papua New Guinea that the aftermath of the explosion could be a devastating tsunami. 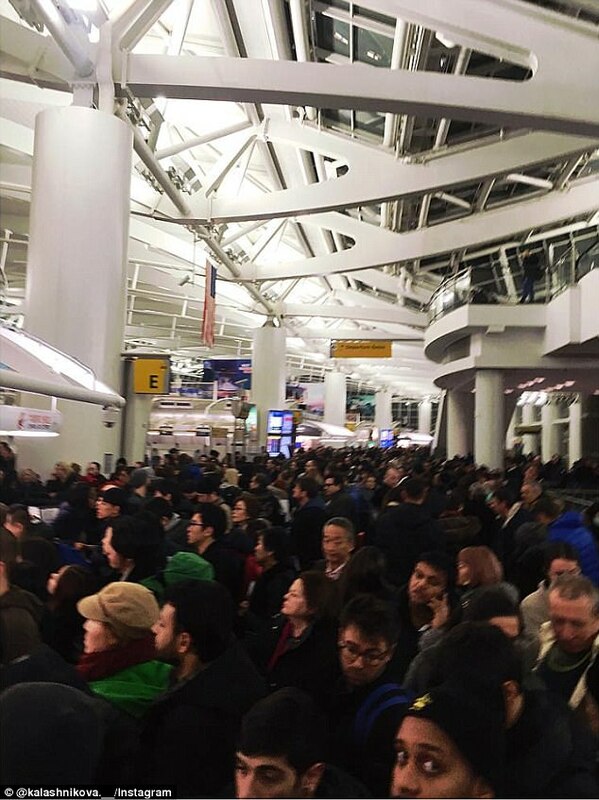 Thousands of passengers are stranded at John F Kennedy airport following more than 6,000 flight cancellations or delays stemming from the 'bomb cyclone' that rocked the Northeast on Thursday. The airport had closed on Thursday afternoon due to the storm and was reopened on Friday morning. But the reopening has been compounded by further disasters - such as a plane needing to turn back for an emergency landing after a false alarm and a collision on the tarmac. A plane being towed at New York's John F Kennedy Airport struck a Kuwait-bound airliner, prompting the flight to be cancelled. A China Southern plane clipped the right tail end of a Kuwait Airways plane before the latter was due to takeoff for an overnight flight around 12am Saturday morning, the Port Authority said on Twitter. Both aircrafts, which were Boeing 777s, sustained damage. No one was injured. Kuwait Airways tweeted in Arabic that their plane was made inoperable due to the crash. Passengers on Kuwait Airways flight 118 were taken to hotels and alternative routes for them will be planned, NBC New York reports. The nightly low reached 9 degrees Fahrenheit (-13 degrees Celsius) the night of the crash. 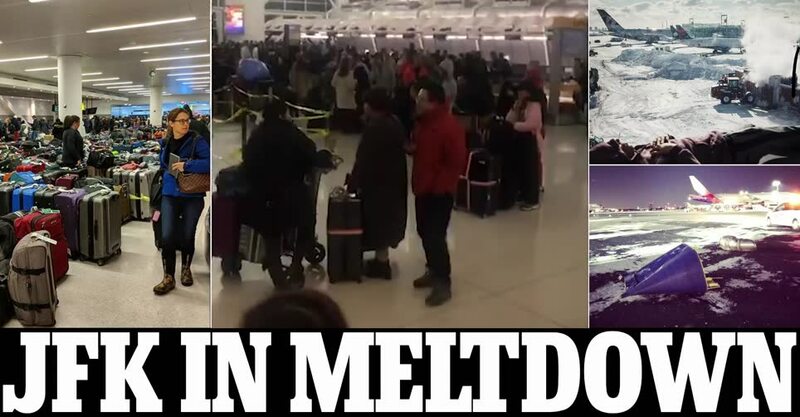 The crash comes amid travel chaos across the East Coast in the aftermath of the 'bomb cyclone' blizzard which wreaked havoc along the Eastern Seaboard on Wednesday and Thursday. 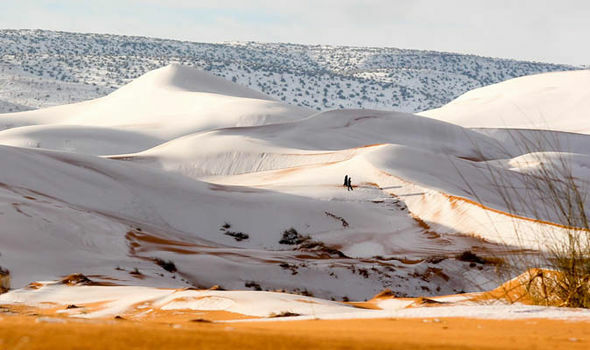 More than 15 inches (40cm) has blanketed sand dunes across the small town of Ain Sefra, Algeria. It is the second time snow has hit in nearly 40 years, with a dusting also recorded in December 2016. But this snowfall which hit yesterday, is much deeper than the fleeting shower little more than a year ago. 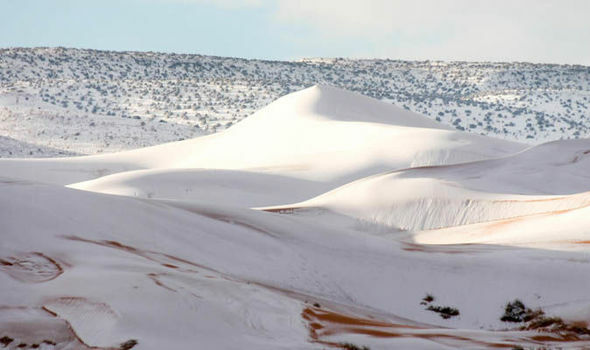 Locals, who endure temperatures of 37C in summer, were stunned as dense snow settled on the town, known as ‘the gateway to the desert’. Before that, snow was last seen in Ain Sefra on February 18, 1979, when the snow storm lasted just half an hour. The cold snap comes as Europe and the United States froze in bitter temperatures. Winter Storm Grayson, battering the US east coast, has seen the sea freeze in Cape Cod, along with the Niagra Falls in stunning scenes. A spokesman for the Met Office said this morning: "Cold air was pulled down south in to North Africa over the weekend as a result of high pressure over Europe. 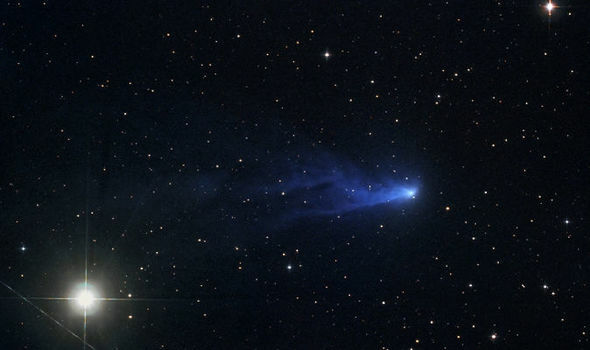 A DISTANT comet is emitting a strange blue light which is both mesmerising and confusing astronomers. Known as Comet PanSTARRS or C/2016 R2, the space body has been alerting experts who noticed it is leaving a bizarre blue trail in its wake. Astronomy photographer Michael Jäger took images of the comet from his base in St Oswald, Austria, on January 6. The comet seems to be on a strange and chaotic trajectory beyond the orbit of Mars, with a series of images merged into one showing it takes an almost rectangular, or “knee” as Mr Jäger puts it, turn. The blue trail left behind by the comet is actually a result of an abundance of ionised carbon monoxide (CO+) which is stored inside. As it the CO+ is released and hits the vacuum of space, it reacts to leave the fluorescent blue glow. The comet is currently heading towards earth and will make its closest approach to the sun in May. Astronomers Kacper Wierzchos and Maria Womack of the University of South Florida used the Arizona Radio Observatory's 10 metre Submillimeter Telescope at Mount Graham to analyse the comet. When it changes to gas quickly, the CO+ can act as a jet, pushing the comet on a different trajectory. Comet observer Michael Mattiazzo of Australia said: "The last notable comet with high CO was Comet Humason in 1962, so this is quite a rare sight. "It will be very interesting to watch Comet PanSTARRS as it makes its closest approach to the sun in May 2018." 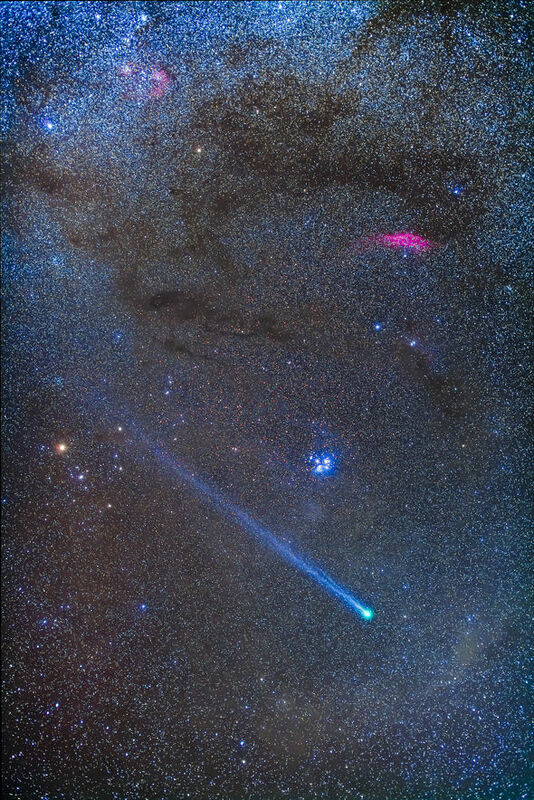 Comet PanSTARRS arrives just as another comet left a meteor shower visible from Earth. NASA has said: “Asteroid 2003 EH1 takes 5.52 years to orbit the sun once. 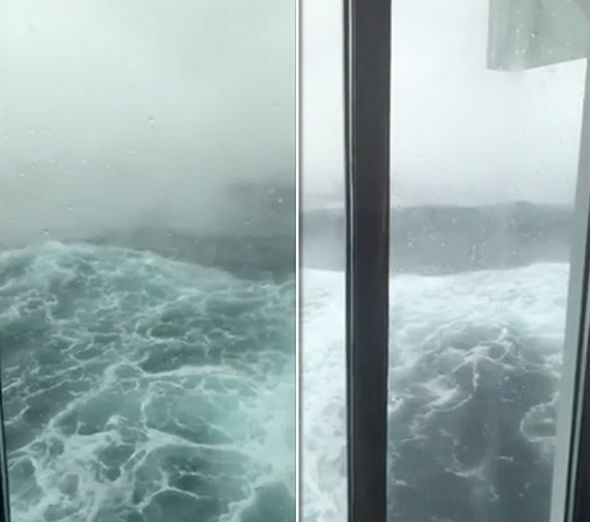 A viral video has appeared online showing a cruise ship battling brutal waves in the Caribbean. The area is usually known for lush weather but it does have a stormy season that can ravage the usually paradisiacal landscape. Huge waves up to 30 feet high rage against the side of the ship. 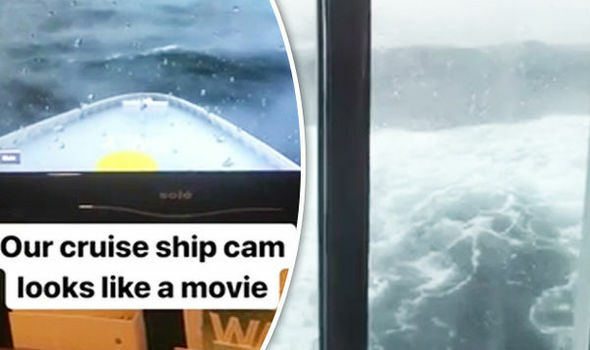 The short film shows various scenes of a violent storm that is blowing a gale outside the ship. Another excerpt from the video is filmed in a lobby where it is possible to hear the wind outside. The harsh weather is creating whistling sounds as the Norwegian Breakaway cruise ship moves through the fast winds. The video was filmed on a mobile phone and uploaded to Twitter by a woman named Christina Mendez. At one point in the video she tells viewers: “This is not a movie, this is really our view.” Christina Ross was one of a group who were travelling back from the Caribbean to New York. They had been on the trip for an 80th birthday celebration. The 4,000 passengr ship sailed into the storm during the night and were caught in the fray for two days. Mount Washington NH 2nd coldest place on EARTH this morning! 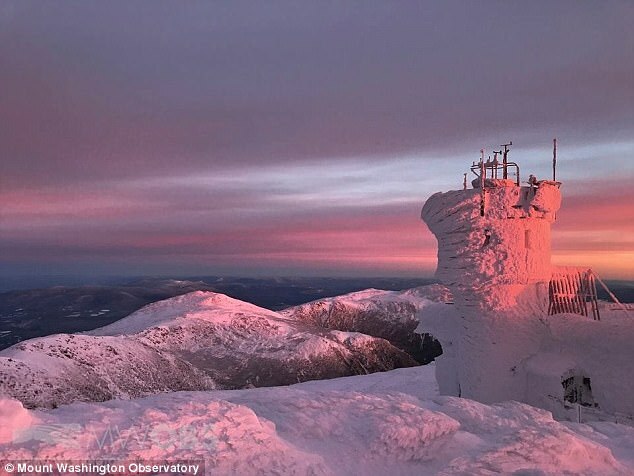 Check this out from MW Observatory..
Mount Washington Observatory in New Hampshire isn’t just cold — at minus 36 degrees with a windchill of 94 below, it’s tied for the second-coldest place on Earth, according to a tweet from the observatory. In fact, according to the latest data available from the Curiosity rover on Mars, Mount Washington feels colder than the surface of our celestial neighbor, which was measured at minus 78 degrees. As of Saturday morning, the wind was gusting at more than 100 miles per hour at the summit, which is 6,288 feet above sea level, according to the observatory’s website. If you’re wondering what place on Earth could possibly be colder than Mount Washington, it’s Eureka, Nunavut, at minus 40 degrees. But with winds of only 2 miles per hour, Eureka comes in at a balmy windchill of minus 50 degrees. 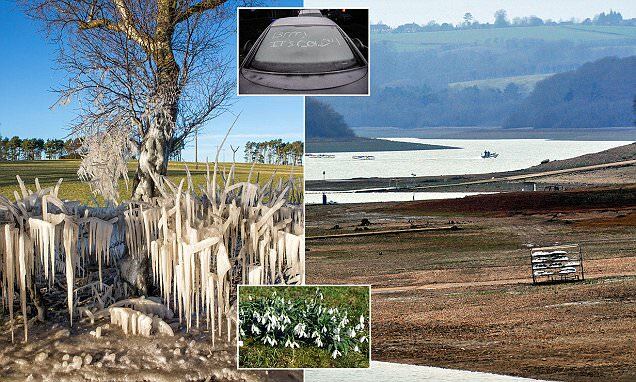 Britain continues to shiver in freezing conditions with temperatures plummeting to -9.8C overnight but milder weather is on the way. The mercury dropped to -9.8C (14.4F) overnight at Strathallan in Perthshire, while temperatures of -9C (15.8F) and -8C (17.6F) were recorded at Glasgow and Edinburgh Airport. Police Scotland this morning dealt with 25 road crashes in an hour amid icy conditions across the country. Freezing conditions continued in Scotland as splashed water from the A702 in the Borders created an icy spectacle (left). The cold snap is expected to ease over the coming days, with some parts of the south expected to reach highs of 10C (50F), bringing some welcome respite from the Arctic blast. Despite recent torrential downpours following Storm Eleanor, Southern Water has applied for a drought permit to replenish the Bewl Water reservoir near Tunbridge Wells (right picture). The changeable weather has also seen blooming snowdrops at Colesbourne Park, near Cirencester, which tends to mark the first sign of spring (inset). NASA’s AIM spacecraft is monitoring a vast ring of electric-blue clouds circling high above Antarctica. This is the season for southern noctilucent clouds. Every year around this time, summertime water vapor billows up into the high atmosphere over Antarctica, providing moisture needed to form icy clouds at the edge of space. Sunlight shining through the high clouds produces an electric-blue glow, which AIM can observe from Earth orbit. The formation of strange clouds in the high atmosphere over remote Antarctica may seem to be of little practical interest–but that would be incorrect. Researchers studying NLCs have discovered unexpected teleconnections between these clouds and weather patterns thousands of miles away. 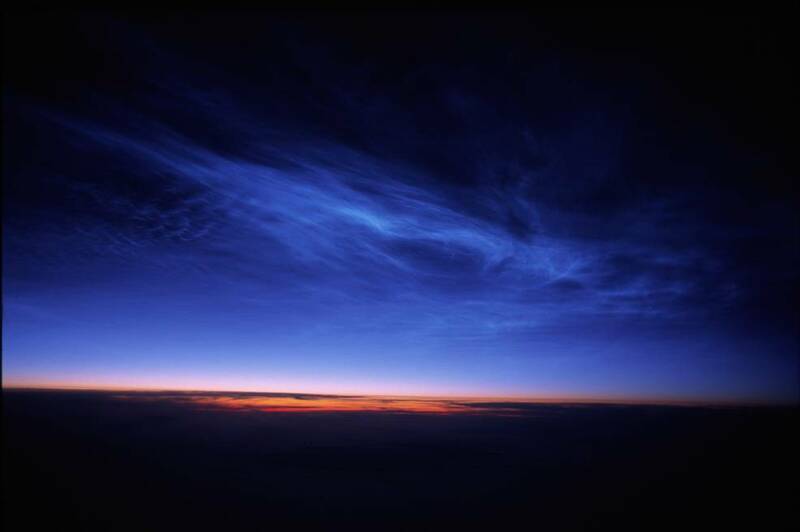 Two years ago, for instance, Randall and colleagues found that the winter air temperature in many northern US cities was well correlated with the frequency of noctilucent clouds over Antarctica. Understanding how these long-distance connections work could improve climate models and weather forecasting–all the more reason to study eerily beautiful NLCs. Sixteen people are dead, 24 are missing and at least 300 are trapped in mudslides which have torn the wealthy town of Montecito apart. The death toll climbed on Wednesday as emergency workers pulled bodies from a river of knee-deep mud and boulders which rained down on homes after a torrent of rain earlier in the week. The debris was able to rush down on to the community because the hillside vegetation which would have ordinarily impeded it was all stripped during the catastrophic wildfires last month. Many residents put themselves in danger by not heeding mandatory and voluntary evacuation orders issued while there was still time to escape. Emergency services attributed the decision to 'evacuation fatigue' after last month's fires which drove hundreds of thousands from their homes. As more unthinkable damage rocked the area, celebrities were among those who found themselves caught up in the chaos. 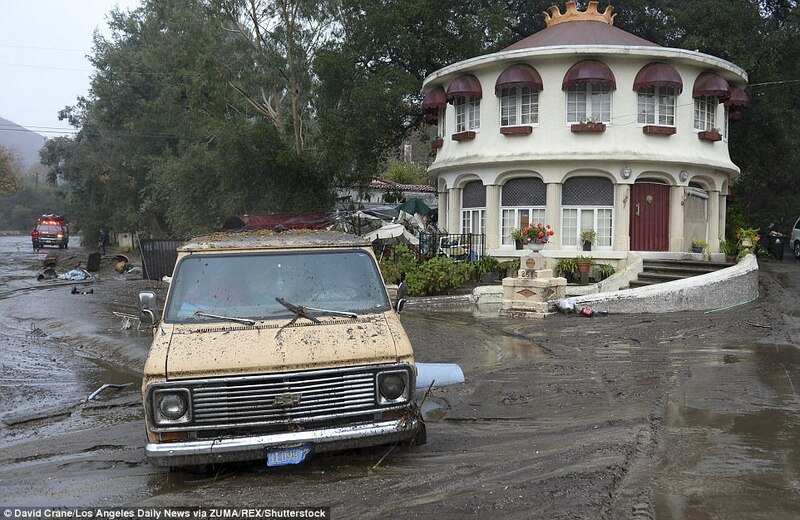 Mudslides in Sun Valley, California, left this van stuck in the mud along La Tuna Canyon road in Santa Barbara County on Tuesday. La Tuna canyon was closed due to mud flows as deep as three feet. Oprah Winfrey's $50million home survived the damage and she was not home for the worst of it but she visited the site on Tuesday to share her shock and grief. Tennis star Jimmy Connors revealed to fans that he had to be airlifted out of his home to safety. As they surveyed the damage, 300 people remained trapped in the hillside community of Romero Canyon which has become impassable. Authorities are working on an evacuation plan to airlift the hundreds of stranded residents to safety. The first victims has been identified. They include fathers and husbands whose wives and children were rescued but they were swept away. Among the missing are sisters Morgan Corey, 25, and Sawyer Corey, 12, who were asleep in their home when the mudslides hit. The first confirmed death was Roy Rohter (pictured above), a former real estate broker who founded St. Augustine Academy in Ventura. His wife Theresa was injured by the mudslide. As the scale of the damage begins to emerge, questions persist over why so many died in the devastation. Part of the answer lies in what emergency services have called 'evacuation fatigue', a complacency or refusal to heed their warnings after last month's catastrophic fires. NBC cited officials who said they were worried residents would not take the mudslides as seriously and not leave. Bridget Bottoms, a resident who chose to stay at home appeared to confirm their fears, telling The Los Angeles Times: 'It sounds foolish but it's like, "how bad can it get?". About 7,000 residents in Santa Barbara County were ordered to evacuate before the downpour on Tuesday, and another 23,000 were urged to do so voluntarily - but many remained in their homes. Winfrey shared video of her home following the floods to let her followers know she was safe and her $50million home had survived the storm. She stood in knee-deep mud and debris as she said a fence had been knocked town and that she was 'devastated' over the damage to her neighbor's house. Winfrey previously shared a number of videos on Instagram showing the knee-deep mud in her yard, a gas fire nearby and helicopters rescuing her neighbors. 'What a day!' she said on the social media site as she filmed from her $50million estate in Montecito. 'Praying for our community again in Santa Barbara. Elsewhere in Montecito, Berkeley Johnson (pictured left with his wife, Karen) dug a baby out of four feet of mud after hearing crying coming from the neighbor's house. Stan Deyo returns to discuss the severe weather across the world - from the extreme cold in the United State and the extreme heat in Australia. Listen to Stan's analysis and what the current weather conditions could portend for this spring and summer. Also, Stan discusses the geopolitical situation in the Middle East and Iran. Informative as always. This is an interesting dude.. very smart about what’s going on with the planet’s weather and climate extremism. The main weapons in this relentless war on humanity are weather modification, climate engineering and atmospheric manipulation. Those who currently possess the geoengineering weaponry know that whoever controls the local weather patterns and the regional climate trends essentially controls the planet. KEY POINT: The New World Order agenda has multiple planetary goals, some of which appear to be mutually exclusive. Others appear to work at cross purposes with each other. That’s because there are different NWO factions currently vying for power and influence throughout the world community of nations. Nevertheless, it is the NWO globalists who currently own and operate all the geoengineering technology and equipment, which allow them to effectively alter the weather around the globe at will. 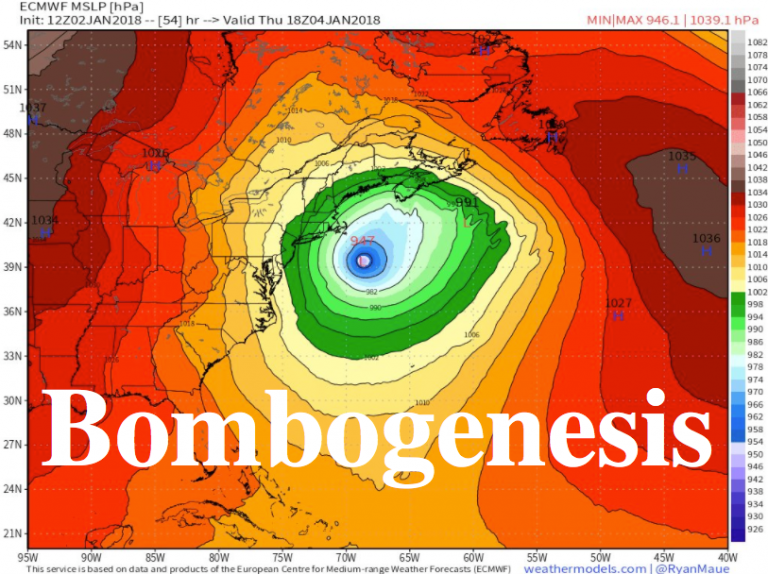 Because they employ most of the geoengineers, it’s quite easy for them to experiment with new storm manufacturing and manipulation techniques such as “bombogenesis”. Not only do the resulting natural disasters and manmade catastrophes significantly advance their pet projects like U.N. Agenda 21 and 2030 Agenda for Sustainable Development, they also serve to facilitate the achievement of other totalitarian objectives. Whenever the USA is bombarded with the likes of a Hurricane Katrina or Superstorm Sandy, Hurricane Harvey or Hurricane Irma, the timing, location and severity of these frankenstorms are essential to understanding their true purpose. Given the fairly recent meteorological phenomena known as “bombogenesis”, it’s clear that the geoengineers are the new artillery men of the 3rd Millennium. In fact, they are painstakingly manufacturing new weather weapons by the year which can then be stealthily employed to launch attacks anywhere on planet Earth. The U.S. mainland has been the primary testing ground for these geoengineered frankenstorms as the entire South witnessed during the 2005 Atlantic hurricane season. 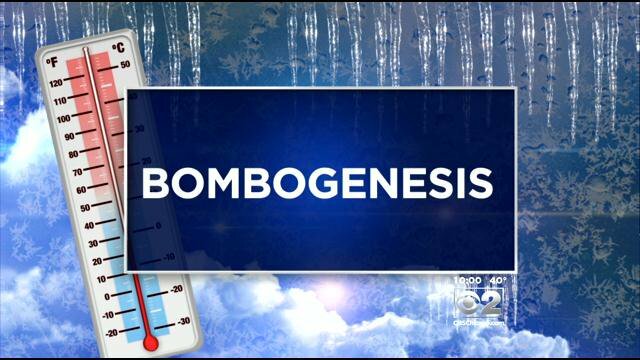 That was the year that “bombogenesis” first went prime time. What’s the critical point here? That the geoengineers are fabricating a whole new weather lexicon to accommodate their newfangled weather weapons. They have no choice but to do this lest they be found out by those states and cities, coastal communities and other locales that have been targeted for destruction. The preceding graphic and following link well illustrate just how determined the geoengineers are to provide cover for their highly destructive weather weaponry experiments. How is it, after all, that 14 of twenty hurricanes were the product of “bombogenesis” during such a short two-month period in 2014?! The crucial understanding for the U.S. citizenry is that the 50 states are under unrelenting attack, as they have been since the 9/11 false flag terrorist attacks. The Deep State globalists have executed numerous black operations and psyops throughout the country since September 11, 2001. But only those initiated in the realm of geoengineering arcana know that many of these “shock and awe” attacks have been made via weaponized weather. Unknown to most, the primary weapons of choice are now catastrophic weather events and calamity-causing climate engineering. In this way the globalists and geoengineers had hoped to avoid the scrutiny of the ever-probing criminal investigators since highly distracting false flag operations can be much more easily carried out via weather weaponry. It appears to be quite difficult for many readers to understand how superstorms are first created and then carefully guided to their predetermined destinations. Highly advanced scientific techniques and applied technology are now routinely utilized within the realm of geoengineering. Chemical geoengineering via chemtrails & chembombs, HAARP frequencies, Nexrad transmitters, power plants, as well as secret satellite-based modalities, are used with great dexterity in the manufacturing and steering of major hurricanes. However, in order to maintain plausible deniability, the geoengineers are now quite adept at taking a nascent and natural storm brewing off the coast of Africa and ramping it up to a Category 4 or 5 within hours. (Read: Is purposeful geoengineering causing the ‘rapid intensification’ of the 2017 hurricanes?) Geoengineering frankenstorms during hurricane season provides all the cover the globalists need to get away with these acts of war and terror practically scot-free. It’s important to note that these geoengineered mudslides occurred after the worst wildfire season on record in California. Those geoengineered firestorms took place with such unrelenting ferocity because of the geoengineered drought that officially began during Governor Jerry Brown’s first term in January of 2011. Because Governor Brown was installed by the globalists to lead the pacesetting state of California into the New World Order, he has shown an extraordinary willingness to advance their agenda(s). This specifically includes the U.N. Agenda 21 and 2030 Agenda for Sustainable Development. While the preceding observations about the Governor may seem harsh to some, all one has to do is perform a retrospective assessment of his actions and inactions since he took office. Brown has consistently acted contrary to the safety of the residents as he has against interests of the state. And his adamant refusal to even consider the massive body of hard scientific evidence supporting one geoengineered calamity after another is proof positive of his outright complicity. There can only be one conclusion to this ever-worsening geoengineered predicament. The participating geoengineers and their hidden globalist masters must be arrested for crimes against humanity. Now that “bomb cyclones” have become an ‘accepted’ weather weapon in the geoengineering arsenal, those who are aware of this deteriorating state of affairs are compelled to share this knowledge. Criminal actions on this scale warrant a countervailing force of people power (with torches and pitchforks in hand). Now that Operation Indigo Skyfold has been exposed by a military pilot as the criminal geoengineering conspiracy that it truly is, many folks are now aware of the weather warfare being waged against them daily. Likewise, Operation Cloverleaf was revealed several years ago as a potpourri of “Aerosol and Electromagnetic Weapons” being used on populations around the globe—24/7. Perhaps the time is now upon US (especially the American people) to stop the genocide and wholesale destruction of our planetary home. We the People must act before it’s too late. When climate change is occurring across the planet, alternately, as both global warming and global cooling, a sea change in consciousness is imminent; otherwise, a real cataclysmic sea change will transpire to the chagrin of everyone. It’s incumbent upon all inhabitants of planet Earth to be responsible caretakers for the sake of future generations. When any individual comes to possess the highly consequential knowledge contained in this exposé, they are obligated to act on it, yes? Even experienced chemtrail watchers, however, are unaware of the much more insidious plot afoot that is being executed by way of geoengineering programs. This concerns the systematic, indiscriminate, wide-area spraying of skies everywhere with alumina (aluminum oxide derived from coal fly ash), which eventually becomes chemically-mobile aluminum in the atmosphere. This single dynamic has created an unmitigated disaster for each and every nation, as well as every resident of this blue orb. This weighty matter will be taken up in Part II of this series under the title: THE ALUMINUM CONSPIRACY: The World’s Most Destructive, Debilitating and Deadly. Tokyo's ambulance service has experienced its busiest day in more than 80 years, officials said Thursday, amid icy conditions as the Japanese capital shivers through its coldest temperatures in decades. As a cold snap grips Japan, the mercury in Tokyo dropped to minus four degrees Celsius (25 degrees Fahrenheit), the coldest in 48 years, according to Japan's Meteorological Agency. "The weather agency has issued a low temperature warning for Tokyo for the first time in 33 years ... The cold weather will continue until Saturday." A rare heavy blanket of snow in Tokyo on Tuesday left thousands of travellers stranded and scores injured. 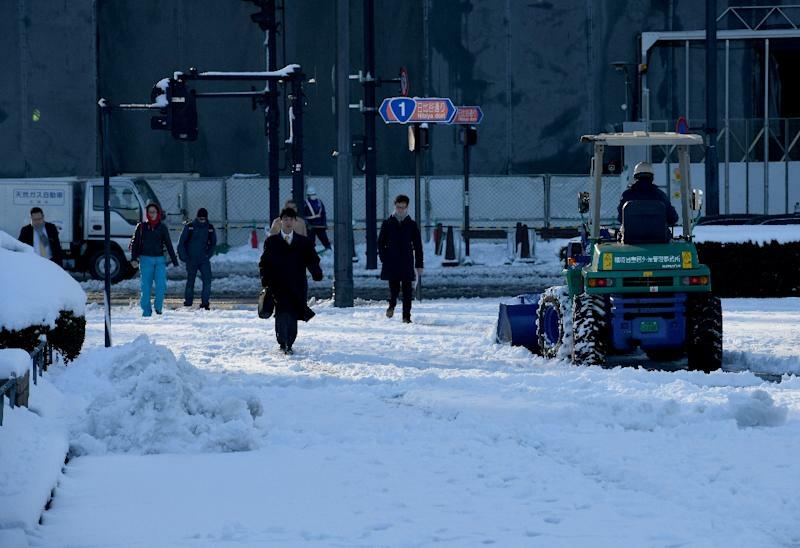 Japan's weather agency recorded as much as 23 centimetres (9.2 inches) of snow in some parts of Tokyo, the biggest snowfall since February 2014. 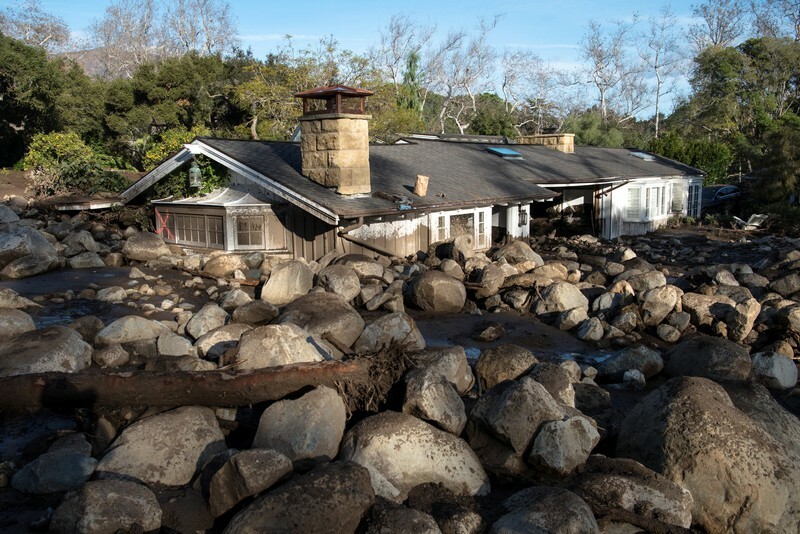 SANTA BARBARA, Calif. (AP) — In the days before mudslides devastated California neighborhoods, officials released conflicting evacuation orders that left some hard-hit neighborhoods out of the warning zone, a newspaper reported Tuesday. A separate map on the county's website showed a larger voluntary evacuation zone that included homes not covered by the sheriff's list. Of the 21 people killed in the mudslide, at least a dozen lived in areas that were covered by the county's evacuation map but not included in the Sheriff's Office warnings, according to records reviewed by the newspaper. LEGAZPI CITY, Philippines (Reuters) - A huge plume of ash billowed from the glowing peak of the Philippines' most active volcano on Thursday, as more residents of surrounding areas fled and experts warned of further escalation 12 days after it started to erupt. 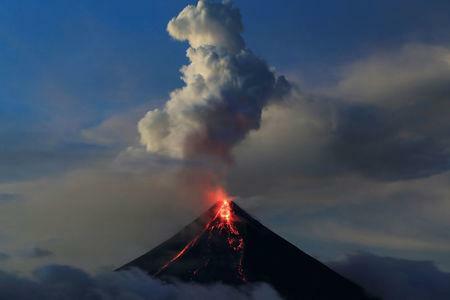 A cloud hovered some 8,202 feet (2,500 meters) above Mount Mayon in central Albay province and orange lava fountained and flowed down from its crater as magma continued to move beneath. Government offices and schools have been closed in 17 towns and municipalities and 66 flights have been canceled in recent days. The authorities have warned residents far from the area to stay indoors to avoid heavy ash fall. The alert remains just one notch below the highest level of 5, after five more episodes. 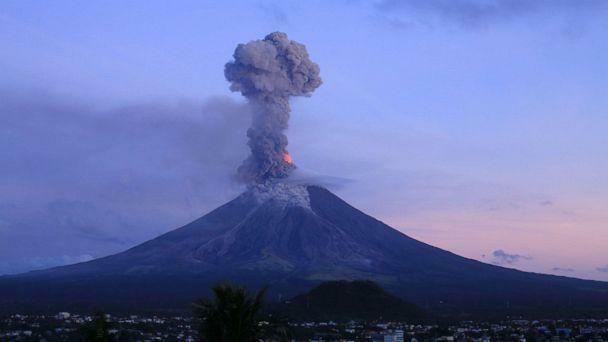 The provincial government has expanded the no-go area around the 2,462-metre (8,077-foot) Mayon to a radius of 9 kilometers. 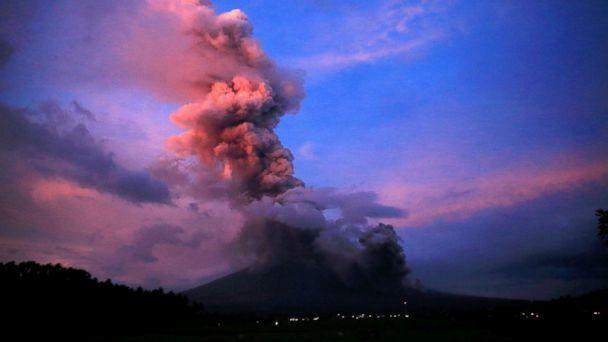 Mayon was showing no signs of calming down soon, said Paul Alanis of the Philippine volcanology agency. 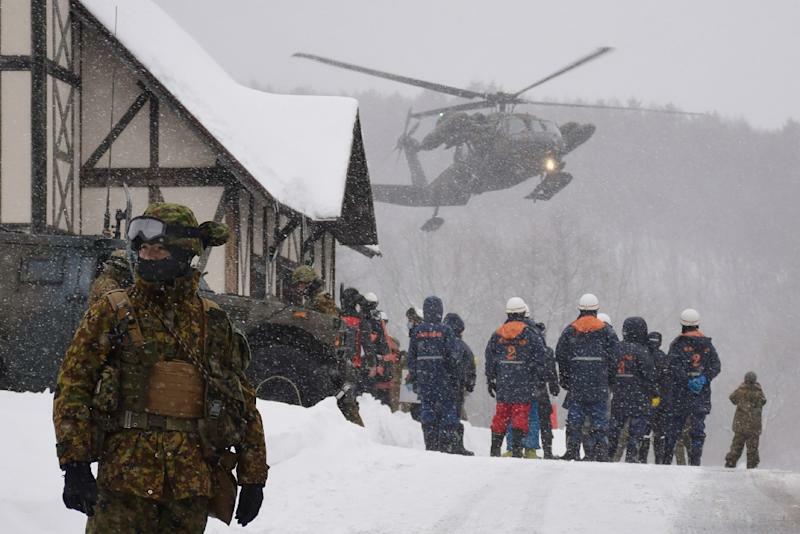 Tokyo (AFP) - New volcanic activity Wednesday forced Japanese police to suspend search operations a day after an eruption near a popular ski resort that killed a soldier and injured several other people. Tuesday's eruption of Mt. Kusatsu Shirane was its first since 1983, but Japan has scores of active volcanoes and sits on the so-called Pacific "Ring of Fire" where a large proportion of the world's quakes and volcanic eruptions are recorded. There are currently 111 active volcanoes in Japan, according to agency officials. An earthquake with a preliminary magnitude of 8.2 struck off Alaska’s Kodiak Island early Tuesday, initially prompting a tsunami warning. The warning has since been cancelled, but an advisory remains for part of the state. guess where else it was felt? Florida. Water levels in Florida wells changed briefly after Tuesday's earthquake in the Gulf of Alaska.Seismic waves traveling through the earth often cause groundwater changes after earthquakes. Tuesday's 7.9 magnitude earthquake in the Gulf of Alaska sent vibrations through the earth that caused water to rise and fall in wells in Florida, thousands of miles away. Sensors near Fort Lauderdale and Madison, near the Georgia border, showed a minor change in water levels after the earthquake, according to the United States Geological Survey (USGS). A water level rise from 41.59 feet to 41.77 feet was recorded at the well near Madison before it returned to normal. At the well near Fort Lauderdale, the water level fell from 1.42 feet to 1.31 feet. Why did water levels in these wells some 3,800 miles away from the earthquake's epicenter change? A 5.2 magnitude northwest Pennsylvania temblor in 1998 rendered dry about 120 wells for local homes for about three months. The Denali, Alaska, 7.9 magnitude earthquake of 2002 caused a well in Wisconsin to rise 2 feet. When a 9.0-magnitude earthquake hit Japan in 2011, Florida’s water table quivered from the Keys to Orlando. Haiti’s devastating 2010 earthquake also shook up Florida’s groundwater. In 1964, following Alaska’s massive 9.2 quake, some state water tables spiked by as much as 20 feet. Blame the state’s porous limestone, where water can flow more freely and quickly register changes. Tuesday’s fluctuations were likely triggered by seismic waves, USGS officials reported. “Think of it as the ripples in a glass of water on a table when a truck drives by outside,” they said. If you missed this latest entry in Florida’s freaky phenomena, you’re not alone. Water levels returned to normal within minutes. The new year is off to a frigid start as much of the country is gripped by an Arctic chill. The blast of cold air has hit the Plains, Midwest, South and East and is soon to be followed by another reinforcing shot of Arctic air that will last through the end of the week. Wind chills 50 to 60 degrees below zero were recorded in the Dakotas in the beginning of the week, while the coldest temperature was a reading of 45 degrees below zero in Embarrass, Minnesota, early Sunday. At least 19 people have died as a result of the bitter cold. The National Weather Service as released wind chill advisories and warnings over a large area of the U.S., from the Plains and Midwest to the southern and eastern U.S. Wind chills as low as 45 degrees below zero in the Midwest and New England could lead to frostbite in as little as 10 minutes. Many school districts have remained closed, extending the holiday break for children, due to the dangerous temperatures.